Protein is an essential macronutrient necessary for a healthy diet. Protein facilitates important functions including muscle, bone, and skin development; hormone production; and immunity. For individuals following a vegan lifestyle, optimizing adequate protein is not difficult, but it does take mindful consideration. Before we get into vegan sources, let’s first discuss amino acids, the building blocks of protein. Amino acids are the organic compounds that join together to form a complete protein. When protein breaks down as we digest food, amino acids are the result. There are 20 different types of amino acids. The sequence of these amino acids determines the specific function of a protein. Amino acids come in three categories: essential, nonessential, and conditional. There are nine essential amino acids that our bodies do not make or produce at a slow rate, which requires them to be obtained through food. Nonessential amino acids are produced by most healthy individuals or stored within the body. Conditional amino acids denote proteins, which are only necessary for specific times such as during trauma, stress, illness, injury, or premature birth. Protein in food is broken down into amino acids via digestion. The body then converts those amino acids into its own usable forms of protein. To make a protein, the cells in the body must have all the amino acids required for that specific protein. Since nonessential amino acids can be made within the body and essential amino acids come from food sources, it is imperative to include all the essential amino acids in your diet. Humans need protein to create structures in the body such as muscle, bone, skin, and tissues. Protein is also necessary to help maintain the body’s fluid and electrolyte balance, acid-base balance, hormone production, transportation of fluids and nutrients, protection against disease, and fuel when absolutely necessary. In Western culture, there exists a common belief that the more protein the better. In some scenarios such as extreme body building and during certain disease states, extra protein is necessary. But excessive protein intake when not warranted can lead to health complications including an increased risk for heart disease, kidney disease, and bone loss. When adhering to a vegan lifestyle, it’s important to know what protein sources are high quality. A high-quality protein contains all the essential amino acids as well as some nonessential amino acids, which support the body’s functions. Animal sources such as meat, fish, poultry, eggs, dairy, and milk are all considered high-quality proteins. The digestibility of a protein is also something to be mindful of, since proteins need to be digested before we can fully utilize the amino acids. Our bodies digest and absorb certain proteins better than others. Factors that influence a protein’s digestibility are the source of the protein as well as the other foods it’s paired with. Animal protein has the highest percent of digestibility followed by plant-based sources. Vegan sources of protein are derived from plant-based foods. Most plant proteins lack one or more essential amino acids, and therefore are incomplete proteins. This does not mean a vegan lifestyle can’t be healthy and balanced; it just requires some thought and planning. A variety of plant-rich foods are key to optimize protein in a vegan diet. By consuming two different types of plant-rich proteins, you can obtain different amino acids from each source. The two distinctly different plant proteins combine to create what is called a complementary protein. The different plant proteins do not need to be consumed together as long as a whole day of meals contains a variety of essential amino acids. A classic example of a complementary protein is rice and beans. Legumes lack some of the amino acids that rice has, and vice versa. However, when consumed together, or on the same day, rice and beans provide all the essential amino acids necessary to create a complete protein. A vegan is classified as someone who does not eat foods of animal origin. When adhering to a vegan diet, the emphasis should be placed on fruits, vegetables, legumes, wholes grains, nuts, and seeds. Ideally, unadulterated real foods from real sources constitute the primary dietary sources, but there are some vegans and vegetarians that also rely on processed foods and starches full of empty calories. Aside from optimal protein, it’s especially important for vegans to obtain enough B12, Vitamin D, iron, calcium, zinc, and essential fatty acids—all nutrients that may be easier to get from a non-vegan diet. People choose a vegan, plant-based lifestyle for a number of reasons including concern over animal welfare, to offset environmental implications caused by factory farming, to eat more economically, to improve health, or for religious or cultural beliefs. Whatever the rationale, research demonstrates there are plenty of benefits to a plant-based diet. A balanced vegan diet is rich in fiber, vitamins, minerals, and antioxidants, and is naturally low in unhealthy fats. This lifestyle can help combat heart disease, diabetes, and cancer; help maintain a healthy body weight; and improve gut health. Notorious for their not-too-flattering side effects (soak in water and rinse to help reduce gas-producing enzymes), beans are an economical and versatile source of protein, fiber, and complex carbohydrates. 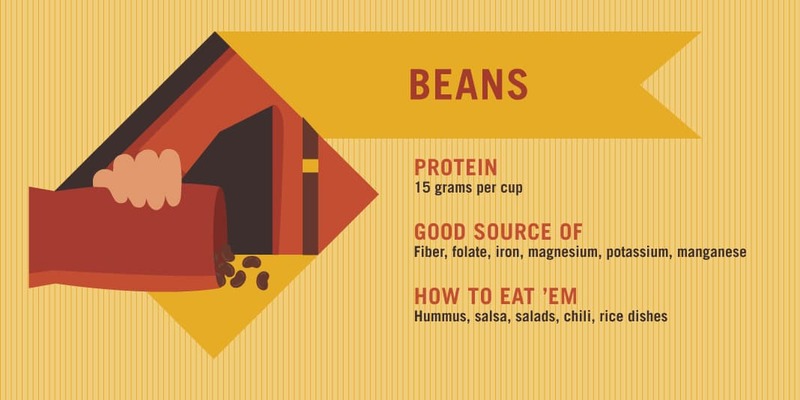 Providing an average 15 grams of protein per cup, beans are a hearty and lean protein that can easily fit into a plant-based diet. Turn chickpeas into hummus, make a black bean salsa, add pinto beans to a salad, toss with brown rice, or make a multibean chili. Chia seeds come in black and white varieties and provide a hearty dose of fiber in addition to 4 grams of protein per ounce. Chia seeds absorb up to 27 times their weight in water (or any liquid), which makes them a great thickening agent. 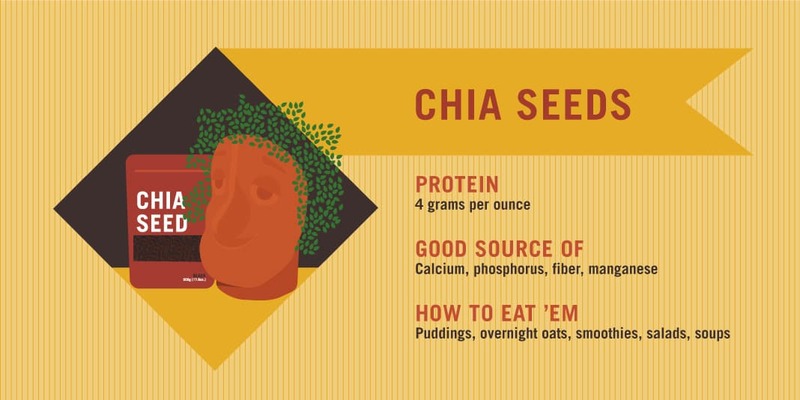 Chia seeds can be used for puddings, overnight oats, smoothies, salads, and soups. These little seeds are rich in protein, with 9 grams in every ounce. They’re also a good source of heart-healthy omega-3 fatty acids. 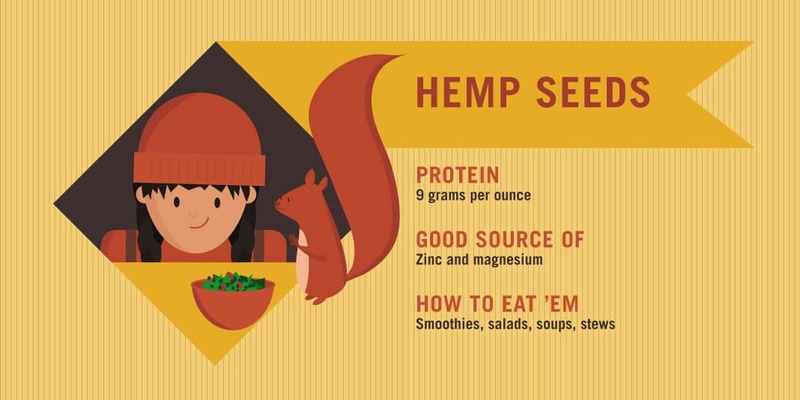 Subtle in flavor, hemp seeds are a great addition to smoothies, salads, soups, or stews. Lentils are another fantastic, economical plant-based protein. These small but mighty legumes are simple to cook and loaded with numerous nutritional benefits. Lentils are high in dietary fiber, which help with digestion, satiety, and cardiovascular health. Lentils are also a good source of vegetarian iron, an essential mineral for oxygen transportation in the blood and proper metabolism. Pairing an iron-containing food with vitamin C assists with optimizing iron absorption. 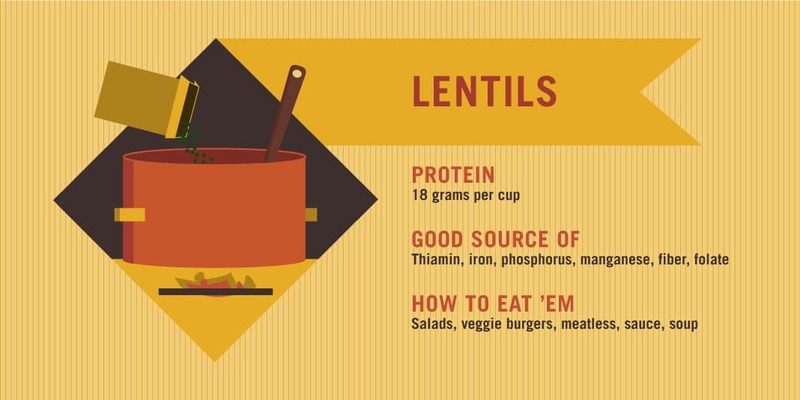 Lentils are a combination of protein, carbohydrate, and fiber and provide 18 grams of protein in one cup. Add to a grain salad, veggie burgers, meatless sauce, or soup. Cashews, almonds, peanuts (technically a legume, but you can find them with other nuts), walnuts, and pistachios all fall into the nut category. 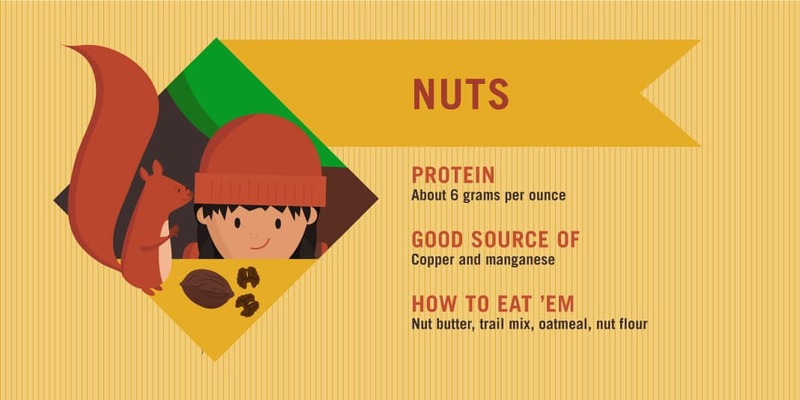 Nuts are rich in vitamins and minerals as well as healthy fats, and contain anywhere from 5 to 7 grams protein per ounce. Spread some nut butter on a banana or toast, make a trail mix, top your oatmeal, or grind into gluten-free flour. All three of these food sources are made from soybeans. Soy is a complete protein, meaning it contains all of the essential amino acids and provides between 10 to 17 grams per ½ cup serving depending on the source. Try to avoid processed, genetically modified, and soy byproducts by carefully reading labels. 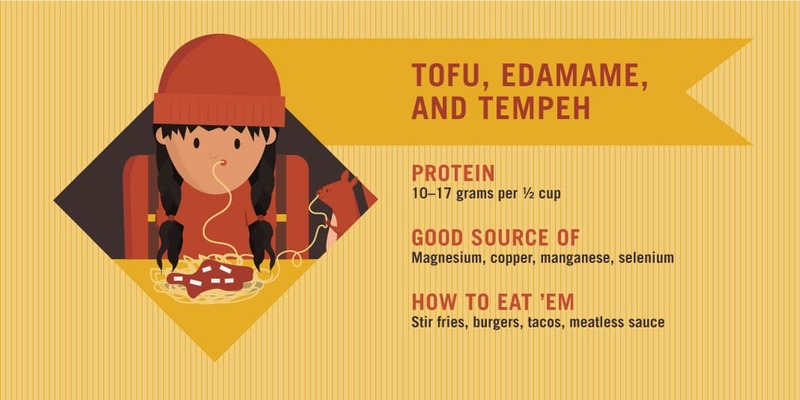 Opt for natural and fermented sources such as organic edamame, tempeh, and tofu. Edamame can be used similarly to beans, made into hummus, or added to salads. Tempeh or tofu can be sautéed into a stir-fry, crumbled into burgers, added to tacos, or substituted for meat in a meat sauce. South American in origin, this seed, which is consumed like a grain, is high in protein and fiber. One cup of this gluten-free carbohydrate contains 8 grams of protein and is a good source of iron and magnesium. 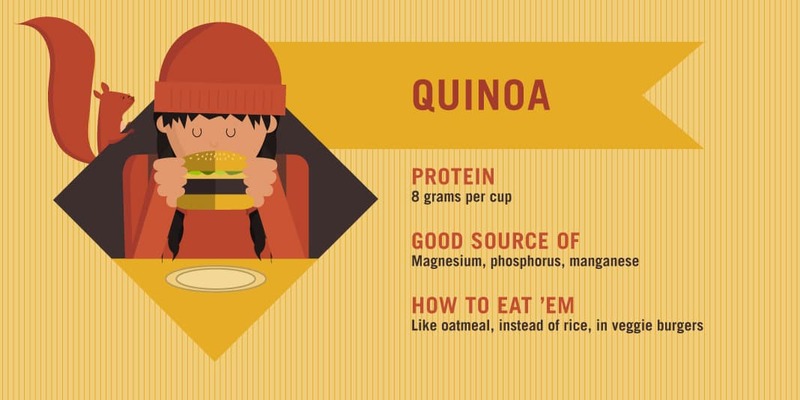 Quinoa is a terrific substitute for rice, can be used in stir fries, can be added to oatmeal for a multigrain breakfast, or can be used to make veggie burgers. Curious about a plant based lifestyle but don’t want to become a full-time vegan? Try integrating more plant-based foods into your meals or instituting Meatless Monday as a way to reap the health benefits without having to say goodbye to meat. Miranda Hammer is a registered dietitian, wellness consultant, and the creator of Crunchy Radish, a health and wellness website. She received her Masters of Science from New York University and spent over a year as clinical dietitian at Montefiore Medical Center in New York. She is a regular contributor to the lifestyle website Refinery 29 and her recipes and nutrition tips have been featured in Fitness Magazine, Well and Good, Birchbox.com, Self Magazine, Marriott Hotels and Resorts, and Conde Nast Traveler. She currently works with private clients, brands, and corporate accounts inside and outside the kitchen. A wonderful and thorough report. Lots of quality information. Thank you! Thanks, Sarmad! We’re glad you found it helpful.